Sori Choi. Photo by Nah Inu. Trio (2018) was commissioned by the Swedish summer festival for contemporary music, Kalvfestivalen, with financial support from the Swedish Arts Council. 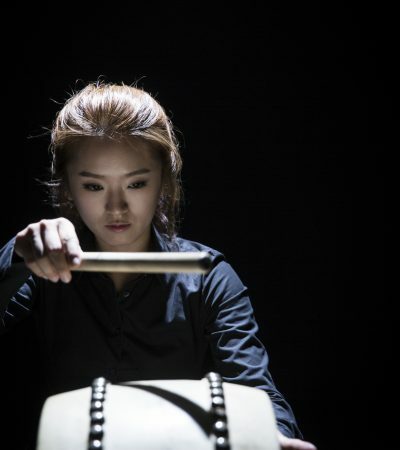 It was premiered in August 2018 by Trio Hellqvist/Choi/Amaral: Sori Choi (traditional Korean percussion), Heloisa Amaral (piano) and Karin Hellqvist (violin). Trio has a traditional form of three movements: energico – tranquillo – energico. The movements are dedicated to Sori, Karin and Heloisa respectively, one of the musicians being in the forefront in each movement. Throughout the piece the percussive and/or timbral aspects of the instruments are explored, either contrasting each other or blending together. The piece was awarded “Special Jury Award” of the 3rd Younghi Pagh-Paan Composition Prize 2018 and performed in the chamber music hall of Berliner Philharmonie in December 2018. Score available at Svensk Musik. Commissioned by Kalvfestivalen and the Swedish Arts Council for Trio Hellqvist/Choi/Amaral. Premiered by Karin Hellqvist, Sori Choi & Heloisa Amaral at Kalv kyrka, August 2018. Busan Metropolitan Traditional Music Orchestra, Kammermusiksaal, Berliner Philharmonie, December 2018. Trio Hellqvist/Choi/Amaral, Kalv kyrka, August 2018. Recording by Kalvfestivalen.